Results of the randomized clinical trial of the dietary combination, conducted by researchers at the Johns Hopkins University School of Medicine, were published in the Nov. 12 issue of Journal of the American College of Cardiology. “Our results add to the evidence that dietary interventions are as effective as–or more effective than–antihypertensive drugs in those at highest risk for high blood pressure, and should be a routine first-line treatment option for such individuals,” says Stephen Juraschek, M.D., an adjunct assistant professor at Johns Hopkins and an instructor of medicine at Harvard Medical School. The Dietary Approaches to Stop Hypertension (DASH) diet, long promoted by the National Heart, Lung, and Blood Institute and the American Heart Association, is rich in fruits, vegetables and whole grains, along with low-fat or fat-free dairy, fish, poultry, beans, seeds and nuts. While both low-sodium and DASH diets have long been known to prevent or lower high blood pressure, Juraschek says the new study was designed to examine the effects of combining the two diets in adults with early or modest forms of high blood pressure–those considered to be at greatest risk for developing more severe forms of hypertension known to increase the likelihood of stroke, kidney disease, heart attacks and heart failure. For the study, investigators tested and followed 412 adults, including 234 women, ranging in age from 23 to 76 years and with a systolic blood pressure of 120-159 mm Hg and a diastolic blood pressure between 80-95 mm Hg (i.e., prehypertension or stage 1 hypertension). Fifty-seven percent of the participants were African-American. Investigators put all participants on the DASH diet or a control diet for 12 weeks. The control diet was similar to that of a normal American diet based on the average macronutrient and micronutrient profile of the U.S. population. All participants were also fed 50 (low), 100 (medium) or 150 (high) mmol/day of sodium in random order over four-week periods. Fifty mmol/day is equivalent to 1,150 mg of sodium. A teaspoon of salt is equal to 2,400 mg of sodium. A diet that includes 100 mmol/day of salt is equivalent to 2,300 mg of sodium — or nearly a teaspoon of salt. This is the maximum level of sodium intake recommended by the U.S. Food and Drug Administration (FDA) and is thought to reduce the risk for heart disease and stroke. At the time of the study, according to the National Health and Nutrition Examination Survey, Americans consumed about 150 mmol/day of sodium, which is considered by the FDA to be harmful and may increase a person’s risk for high blood pressure, heart disease and stroke. Participants were sorted into four groups based on their baseline systolic blood pressure: 120-129, 130-139, 140-149 and 150 or greater baseline systolic blood pressure. After four weeks, the investigators found that the group with 150 or greater baseline systolic blood pressure on just the DASH diet had an average of 11 mm Hg reduction in systolic blood pressure compared to a 4 mm Hg reduction in those solely on the DASH diet, but whose baseline systolic pressures were less than 130. When the researchers combined the DASH diet with the low-sodium diet and compared participants’ blood pressures to those on the high-sodium control diet, they found that the group with less than 130 systolic blood pressure at baseline had a 5 mm Hg reduction in systolic blood pressure; the group with 130-139 mm Hg baseline systolic blood pressure had a 7 mm Hg reduction; and the group with baseline systolic blood pressure between 140-149 had a 10 mm Hg reduction. Most surprisingly, say the researchers, a participant who had a baseline systolic blood pressure of 150 or greater and was consuming the combination low-sodium/DASH diet had an average reduction of 21 mm Hg in systolic blood pressure compared to the high-sodium control diet. 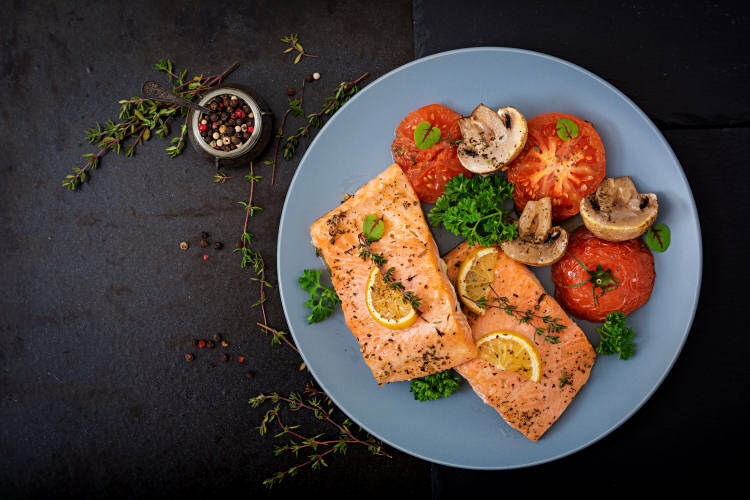 “This is outstanding, it’s huge,” says Juraschek, because it suggests that those at highest risk for serious hypertension achieve the greatest benefit from the combination diet. To put the potential impact of the findings into context, Juraschek says, the FDA requires any new antihypertensive agent submitted for approval to lower systolic blood pressure by 3-4 mm Hg. Most established medications on the market, such as ACE inhibitors, beta-blockers, or calcium channel blockers, on average reduce systolic blood pressure by 10-15 mm Hg. The researchers caution that the study did not address effects in people with systolic blood pressure of 160 or greater or in persons with prior cardiovascular disease or medication treated diabetes. Further studies with larger sample sizes are needed to investigate the impact of the low-sodium/DASH diet on these populations. A Johns Hopkins researcher who also participated in this study was Edgar Miller III, M.D. This work was supported by the National Heart, Lung and Blood Institute under grant numbers U01-HL57173, U01HL57114, U01HL57190, U01-HL57139, K08 HL03857-01, U01-HL57156 and K23HL135273-01; General Clinical Research Center Program of the National Center for Research Resources under grant numbers M01-RR02635 and M01-RR00722; and the National Institute of Diabetes and Digestive and Kidney Disease under grant number T32DK007732-20.